Transparency Market Research delivers key insights on the Metal caps and closures Market in its published report, titled “Global Metal caps and closures Market: Industry Analysis and Opportunity Assessment, 2018–2026”. In terms of revenue, the global Metal caps and closures market is estimated to expand at a CAGR of 3.9% over the forecast period, owing to numerous factors, about which TMR offers thorough insights and forecasts in this report. Metal caps and closures are used to cover or seal the top opening of jars, bottles, containers, cans etc. Metal caps and closures provide protection and preservation of product within the container and prevents them from leakage. These metal caps and closures are fabricated in various materials such as stainless steel, aluminium and tinplate. Metal caps and closures are manufactured depending upon their application which can differ from sizes and closure types. Metal caps and closures type include backing paper made with several lining materials such as foamed polyethylene and pressure-sensitive lines to prevent the contact between content and the metal closure. The material and the closure type provide rigidity and optimum sealing benefits depending upon the need of usage. Aluminium metal caps and closures are high in demand and have numerous applications, beverage sector being the highest. The global market for Metal caps and closures bags market is segmented as per material, closure type and end use. The growing demand for effective packaging to ensure longer shelf life of food and beverages is acknowledged as a key factor driving the metal caps and closures market. Metal caps and closures provide a great barrier to moisture, dirt, oxygen and other pollutants, hence metal caps and closures are to witness a significant growth in pharmaceutical industry. On the basis of material metal caps and closures market is segmented as steel, aluminium and tin plated. Among these aluminium metal caps and closures are widely used, especially in beverage packaging. On the basis of closure type metal caps and closures market is segmented into crown type, screw caps, can ends and other closures. Crown type closures have application majorly in beverage packaging. Can-ends serves both food and beverage packaging industry. Metal caps and closures have a higher application as a sealer for glass bottles. Metal caps or screw caps are mostly used for beverages which act as a tamper evident cap and secure from undesired premature opening of bottle or container. On the basis of end use industry, metal caps and closures market is segmented into food, beverage, pharmaceutical and cosmetics and personal care & cosmetics. This report assesses trends driving the growth of each market segment on the global level and offers potential takeaways that prove substantially useful for other potential market entrants in the metal caps and closures market. The North America metal caps and closures market Include country level analysis for the U.S. and Canada. 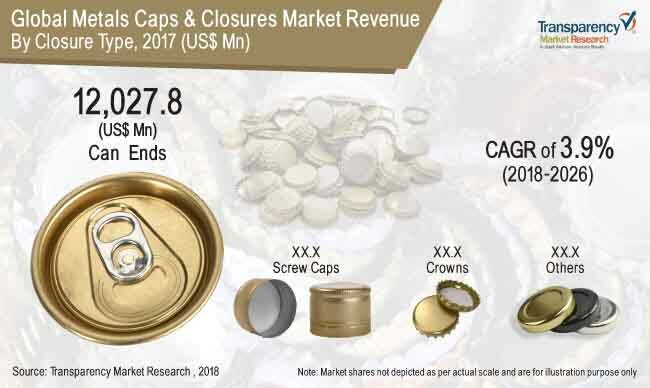 The U.S metal caps and closures market is expected to grow at a CAGR of 1.4% over the forecast period wherein can-ends segment enjoy dominant share, by closure type. The Latin America metal caps and closures market include country level analysis for Brazil, Mexico, Argentina and Rest of Latin America. The Brazil metal caps and closures market is expected to expand at a CAGR of 3.2% during the forecast period. The Europe metal caps and closures market include country level analysis for Germany, Italy, U.K., France, Spain, Benelux, Nordic, Russia, Poland and Rest of Europe. Germany and Italy account for a significant market share in the Europe metal caps and closures market. The Asia Pacific metal caps and closures market includes country level analysis for China, India, ASEAN, Japan, Australia & New Zealand and Rest of APAC. The APAC metal caps and closures market represent most lucrative geographic region wherein India and China represent substantial incremental opportunity over the forecast period. The APAC metal caps and closures market is expected to expand at a CAGR of 5.9% over the forecast period. The Middle East and Africa (MEA) metal caps and closures market include country level analysis for GCC, South Africa, North Africa and Rest of MEA. Metal caps and closures market in the GCC region is particularly driven by high growth in the industrial segment. The MEA metal caps and closures market is expected to expand at a CAGR of 4.4% over the forecast period. In this report, TMR has discussed individual strategies followed by these companies in terms of enhancing their product portfolio, creating new marketing techniques, mergers and acquisitions. The ‘Competitive Landscape’ is included to provide report audiences with a dashboard view and company share collectively.